This account of a month-long US Marine expedition through the war-torn Segovian-Honduran borderlands in February-March 1924 offers a fuller account of the expedition described in Lt. Bourke's official report of 18 Feb. 1924, above. This is not an official report. It takes the form of a long descriptive letter from USMC Sergeant F. F. Birnbaumer to his "sidekick" describing his just-completed 500-mile journey. It was published four years later in the semi-official Marine Corps magazine The Leatherneck (March 1928, pp. 7-8, with two photos). The article offers a fascinating portrait of political and social conditions in the borderlands from the perspective of a plainspoken Marine sergeant and his fellow grunts. Paragraphs are numbered for easier reference. Este informe de una expedición Marina norteamericana, de duración de un mes en el febrero-marzo del ano 1924 a través de la fronteriza Segoviana-Hondureña devastada por la guerra, ofrece una relación más completa sobre la expedición descrito por Bourke en el anterior informe oficial, también de febrero de 1924. Este no es un informe oficial. Toma la forma de una larga carta descriptiva del Sargento de los Marinos, F. F. Birnbaumer, a su "compinche" describiendo su recién concluido viaje de 500 millas. Se publicó cuatro años más tarde en la revista semi-oficial del Cuerpo de Infantería de Marina, Leatherneck (1928 Marzo, págs. 7-8, con dos fotografías). El artículo ofrece un retrato fascinante de las condiciones políticas y sociales en la zona fronteriza desde la perspectiva de un franco Sargento Marino y sus colegas gruñidos. Los párrafos están numeradas para facilitar la referencia. Note: Many thanks to Ms. Linda Pudder, a US citizen currently residing in the Department of Rivas, Nicaragua, for her translation of this article. // Nota: Muchas gracias a Sra. Linda Pudder, una norteamericana que vive ahora en el departamento de Rivas, Nicaragua, por su traducción de este artículo. In the belief that some Leathernecks now serving in Nicaragua will be relieved to learn that Nicaragua jungle ticks and other insects may nibble gleefully, and yet leave but little scars to stamp their memory on passing years, an incident of yesteryear is recalled. Hooray! Just finished scrubbing the last of the cooties off of myself. You have doubtless heard something of the revolution which has been going on in Honduras in a half-hearted fashion since last November. I'm still getting quite a kick out of the thought of Central American "Generals." We were informed, while in Honduras, by a "general" himself that there are thirty-six of them today in that country. Four other marines and myself, together with an interpreter, have been following on the trail of that revolution in both Honduras and Nicaragua for the past month. A radio from the State Department started it all off; that is, our end of the deal. Quite a number of Marines here volunteered for the trip, as it promised to be quite a novelty for the local detachment. Most of the Marines in camp would have been glad to have gone, even though everyone knew it meant hard riding, miserable food, not a great amount of even bad water, and sometimes very little sleep, but then look at the fun we'd have, to which some other member of the party would answer, "Oh, yes." Break out your little map of Central America and follow the "rosebud" trail that we covered on burros. Leon, Chinandega, Punte Real, Somotillo., St. Thomas, San Pedro, San Francisco, Cacamuya gold mines, San Marcos de Colon, Oyote, El Tamarindo, Somoto Grande, Macuelizo, Las Limas, Los Manos, Ocotal, back to Cacamuya mines by way of Somoto Grande and San Marcos, back over the same run in the order above named, finally back to Cacamuya and then home again through Chinandega and Leon, a total distance of five hundred or more miles covered, over the roughest trails imaginable. At two p.m. the five of us set out under orders on a handcar to Chinandega, a station between Nicaragua and Corinto on the Ferrocarril del Pacifico de Nicaragua. 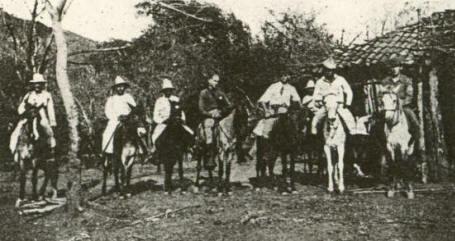 Chinandega was reached that night and we had to lay over until the following evening getting horses and a guide. After much difficulty we secured both mounts and an Indian guide and set out that evening for Somotillo, near the Honduran-Nicaraguan border. All night was spent in the saddle in the worst dust I had ever experienced. In many places it was several feet deep in the sunken trail, a soft, white pulverized dust. The air in the vicinity of the road was so filled with this dust that sight was difficult. We tied handkerchiefs over our noses to keep from suffocating and even then the fine dust sifted through and caused nose-bleed. Morning found us at Puente Real (Royal Bridge). He was indeed a euphemist who gave that bridge its name; a rickety bamboo span over a syrupy little stream, bordered on either side with mud flats. To add insult to injury a toll of 15 cents per person and five cents per animal is charged. Here we left the dust behind and all hands felt like shouting for glee. We soon passed into a cactus and thorn forest, quite a novelty, and all day we rode through a blazing sun, stopping only for a few minutes to rest the horses. We had had no food, water or sleep since leaving Chinandega the night before and some of us were beginning to get a "little hungry." About five miles out of Somotillo my horse fell over and proceeded to die, and I had the pleasure of hiking the remaining miles, feeling none too pugnacious. My saddle and equipment was taken care of by another of our party. Two other members of the party soon had to dismount and lead, or rather drag their horses, the remainder of the way. Somotillo was finally reached; how nice. We chased the nearly naked wash-women out of the only waterhole and drank deep. We still had four or five cans of "willie" and beans and that was reinforced with tortillas (pronounced tor-tee-as). All this went down as if by magic and everyone admitted we felt better. Back we went and chased the dusky maidens out of the waterhole again and went swimming. The next day three of us made a side trip to the border at St. Thomas, which was garrisoned by Nicaraguan troops. We were received with friendly demonstration and treated to our first real native dinner of tortillas, stale meat and very old eggs. Food here in these foothills is not especially appetizing, and particularly now during this revolution. There is very little revolution, but lots of plundering. The tortillas here are made from the poor, stale, worm earthen corn, ground wet and baked into a thin leathery pancake, without any seasoning whatever. Meat is hung up in the sun, but doesn't dry, for the flies get to it first and the maggots next. That little fact doesn't bother the natives though. They nonchalantly knock the worms off with a stick, throw the meat on a hot coal, and presto, you have a nice juicy barbecue. The eggs, they're good though! It sometimes takes several days to find the nest, and then the eggs are buried in straw for a couple of weeks or months maybe. They come out rather peculiar looking--maybe they are a little "rotten." The most prized food here is the birdlike, tough, fighting stock chicken. Once captured, it is sort of cleaned and boiled for about fifteen or twenty minutes. This culinary process sets the flesh and makes it a little less palatable. Then it is served in its entirety on a palm leaf. These people use palm leaves for plates when they aren't too lazy to cut them. Knives, forks, spoons, cups and saucers are unheard of. The good old human hand fulfills all those purposes and gourds make ideal cups. Of course, the menfolk do use knives, the kind they carry around with them and use to chop down trees, kill wild beasts, and other men. They are about four feet long, with a five-inch blade, weigh about three pounds, and bear the label "Collins" if they are the fashionable kind. These make fairly good table knives. I noticed one fellow use one to put a bit of whey on a small cornmeal cake. In the States the farmers call these things corn knives, but here they are machettes. We stayed in St. Thomas only a few hours and returned to Somotillo, having covered about forty miles, a big day's work with poor horses, and our horses were always poor. Another day was spent in hustling horses again. In the afternoon we set out for San Pedro, still higher in the hills and toward the Northeast. We finished the last of our camp provisions and dropped all equipment except a blanket and a saddle bag. We could not carry either food or more equipment on account of the poor horses and the increasingly bad trails. We camped in the hills that night and enjoyed a little coffee and also the ticks, fleas, mosquitoes and such little inconveniences. 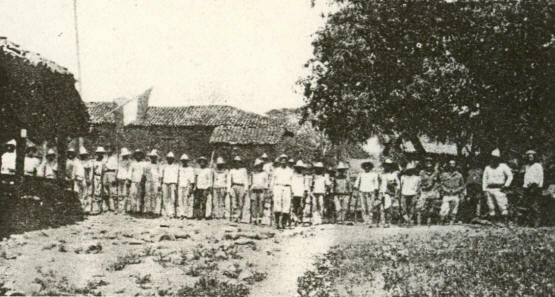 San Pedro, garrisoned by Nicaraguan troops, was reached by noon of the following day, and another native dinner of tortillas and eggs was enjoyed by us. In fact, we lived entirely on native grub for over twenty days and none of us died, although the MO. did treat me to a lot of emetin on my return to camp. Somotillo, St. Thomas and San Pedro were barracks towns with only a few miserable huts, greatly overcrowded. At San Pedro we obtained burros instead of horses, better fitted for hill work and tougher than horses, even on the rider. Every time I see a burro now I want to walk up to him and punch him on the nose and pull his ears. We camped on a ledge that night and by noon next day reached the Cacamuya Gold Mines, managed by an American by the name of Samuelson. We got real food there and how we made his Mex cook put out the chow, and we got a bath, too, and everyone took his first shave in a week. We all appeared much less ferocious with the hair off. We hated to leave Cacamuya a day and a half later, but had to go on to San Marcos de Colon, the headquarters of the Honduran Government troops. There had been a young battle there a week before and the houses were pretty well sprayed with bullet holes. We stayed no longer than it was necessary at San Marcos, and proceeded on to El Tamarindo where we met General Funez with his wing of the revolutionary army. The soldiers here on both sides were mostly Indians, barefooted, with no uniforms except a ribbon for the hat to designate their politics. All the troops wore large straw sombreros, trousers, but no shirts or shoes, and all looked like ancient pirates. They were armed with machettes, old 1884 single-shot Remingtons and old 7 and 11-mm Austrian Mauser rifles, useful as clubs but nothing else. All of the troops were almost starved and have killed off all the live stock in the country. While we were in the general's hut a bunch of soldiers chased a young heifer right up in front of the hut and hacked its head off with a machette. They did not trouble to skin it, but just laid it open and each man fought to get a chunk of meat. Then each man ran off to himself and built a tiny fire to cook his piece. Some of the meat was eaten raw. We were glad to get away from the filth of this place. Our guide led us astray during the night and lost us in a dry river bed where we were forced to camp until morning, and finally got on the right trail to Somoto Grande. It will be noted that we were traveling in Northeastward, part of the time in Honduras and part of the time in Nicaragua. Somoto was reached without further event and three of us left the following day for Honduras again. We were again led astray by a poor guide, who led us off the right trail and into a jungle of underbrush and bull nettles. Macuelizo was reached late that night after a long, hot, tiresome ride on the mules. Macuelizo is a tiny village hidden away in a bowl shaped valley well up in the mountain ridge. The inhabitants are simple, religious folk who seldom venture more than twenty miles from their homes. Las Limas, the highest mountain, most inaccessible, and just inside Honduras, was reached by noon of the next day. Here General Carias, the big chief of the revolutionist cause, and the would-be president of Honduras, had established his headquarters. Carias proved to be a man of good education and was surrounded by staff officers of good mentality. We also met several Americans here, officers in the revolutionist army and soldiers of fortune. The food here was even worse than previously experienced on account of the large number of soldiers here and all supplies are obtained locally, there being no such thing as a base of supplies. The next day we reached Las Manos and spent the night. We nearly froze that night as we were high up and the air was very cold. It was so cold that we were able to see our breath until about nine o'clock the next morning, before the sun came out bright and warm enough to thaw us out. Our southward trip from here to Ocotal and then back to Somoto Grande was made through a beautiful country, pierced by many mountain streams of clear, cold water, and covered with dense pine forests which filled the air with heavy pine fragrance as is sometimes experienced in passing through our own southern pine belt. One man was left behind in Ocotal and the other two joined us at Somoto Grande, but departed the following day for Managua by way of the high road to Leon, and the remaining three of us returned to San Marcos, where it was rumored another battle was soon to take place. We stayed here three days awaiting developments and then returned to Cacamuya Mines. I remained behind at Cacamuya and the remaining Marine and the interpreter shoved off the next morning for San Marcos again, then to Somoto Grande and return to Cacamuya, which trip was made in three days of hard traveling. It was while at Cacamuya that news leaked through of the landing of about two hundred sailors and Marines on the North Coast of Honduras and their occupation of Tegucigalpa. Orders were received to return to Managua, and we journeyed homeward through San Pedro, Somotillo, Puente Real, Chinandega, and then by train to Managua. 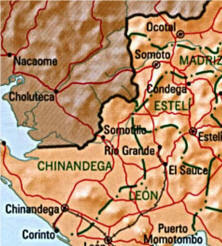 The return trip from Somotillo to Chinandega, a distance of about sixty miles, was again made at night to avoid the heat. We rode for about an hour out of Puente Real through the thick dust, and then, it started to rain, the first of the season, and how it did rain! It came down in waves and blasts. The trail turned into a churned sea of mud and water and the dust on the horses and ourselves turned to muddy streaks, giving us a desperate appearance. Several of the party had purchased native undergarments, which come in bright blues, reds and stripes. These garments usually bleach white after a couple of washings, so when the soaking rain hit us they lost color so rapidly that one Marine, dressed in a bright red garment, presented some appearances of being wounded, and the color did not fade nearly so quickly from the skin as from the garment. The horses became frightened at the unusual amount of swirling water in the sunken trail, which was three feet deep in places, and stumbled and wallowed about throwing one man and covering all of us with mud. We presented a most sorry spectacle upon our arrival at Chinandega the next day, but the following afternoon, when we arrived in Managua once more, we were quite ourselves again, and then after the first big chow someone said, "Just look at the fun we had," to which all hands answered, "Uh Huh." EN EL CONVENCIMIENTO DE QUE ALGUNOS Leathernecks sirviendo actualmente en Nicaragua se desahogarán de saber que las garrapatas y otros insectos de la selva se pueden picar a uno jubilosamente, y sin embargo dejan sino pocos cicatrices sellados en la memoria de los años pasando, un incidente de antaño se recuerda. 24 de Marzo de 1924. ¡Hurra! Acabo de terminar de lavarme bien de los últimos piojos. Sin duda ha escuchado algo de la revolución que se viene realizando en Honduras en medio de manera entusiasta desde el pasado mes de noviembre. Todavía me da una risa al pensar de “Los Generales” de Centro América. Mientras que estábamos en Honduras, un propio "General" nos informó que hay treinta y seis de ellos en ese país hoy en día. Otros cuatro infantes de Marina y yo, junto con un intérprete, llevamos siguiendo el rastro de esa revolución en Honduras y en Nicaragua durante este último mes. Una radiocomunicación del Departamento de Estado empezó todo; es decir, nuestra parte del trato. Un buen número de infantes aquí se ofrecieron como voluntarios para el viaje, ya que prometía ser una novedad para el destacamento local. La mayoría de los Marinos en el campamento habrían tenido el placer de haber ido, aunque todo el mundo sabíaa que significaba viajes a caballo difíciles, comida miserable, ni siquiera mala agua en gran cantidad, y a veces dormir muy poco, pero a ver cuanto nos divertiríamos, a lo cual uno de los otros miembros del grupo respondería, "Aj, sí". Sáquele el mapita de América Central y siga el camino "capullo de rosa" que recorrimos en burro. Leon, Chinandega, Puente Real, Somotillo, Sto. Thomas, San Pedro, San Francisco, Las Minas de Oro Cacamuya , San Marcos de Colón, Oyote, El Tamarindo, Somoto Grande, Macuelizo, Las Limas, Las Manos, Ocotal, de vuelta a las minas Cacamuya por Somoto Grande y San Marcos, a repetir el mismo recorrido en el orden mencionado anteriormente, finalmente de vuelta a Cacamuya y luego a casa otra vez por Chinandega y León, con una distancia total de más de quinientas millas recorridas, a lo largo de los caminos más difíciles imaginables. A las dos de la tarde los cinco de nosotros, bajo las órdenes, salimos en una vagoneta manual para Chinandega, una estación entre Nicaragua y Corinto en el Ferrocarril del Pacífico de Nicaragua. Esa noche alcanzamos Chinandega y tuvimos que quedarnos hasta la siguiente noche organizando caballos y un guía. Tras muchas dificultades conseguimos ambos montajes y un guía indio y por la noche salimos para Somotillo, situado cerca de la frontera hondureña-nicaragüense. Pasamos toda la noche en la silla en el peor polvo que jamás había experimentado. En muchos lugares del camino hundido de varios pies de profundidad, había un suave, blanco polvo pulverizado. El aire en las cercanías de la carretera estaba tan lleno de este polvo que para ver fue difícil. Nos atamos pañuelos para tapar las narices y evitar el riesgo de asfixia y, aun el polvo fino pasó tamizado resultando en hemorragias nasales. La mañana nos encontró en el Puente Real (traducido Puente Regio). El que le dio nombre a ese puente era una experta a los eufemismos; una extensión desvencijado de bambú tendido encima de un quebradito almibarado, que limita a ambos lados con pisos de lodo. Para colmo, un peaje de 15 céntimos por persona y cinco centavos por animal se paga. Aquí dejamos el polvo detrás y todo el mundo tenían ganas de gritarse jubilosamente. Pronto pasamos por un bosque de cactus y espina, una novedad bastante, y durante todo el día andamos bajo un sol abrasador, parando solo un par de minutos para que se descansaran los caballos. No habíamos comido, bebido ni dormido desde que salimos de Chinandega la noche anterior y algunos de nosotros empezábamos a tener un "poco de hambre." A cinco millas más o menos de Somotillo mi caballo se cayó y procedió a morir, y yo tuve el placer de ir a pie el resto del camino, sintiéndome nada pugnaz. Otro de nuestro grupo se llevó mi montura y equipo. Otros dos miembros del grupo pronto tuvieron que desmontar y llevar, o más bien arrastrar sus caballos, el resto del camino. Finalmente llegamos a Somotillo; qué bonito. Corrimos a las lavanderas casi desnudas del único ojo de agua y bebimos profundamente. Todavía nos quedaban cuatro o cinco latas de "chorizo" y frijoles que se reforzaron con tortillas (se pronuncia tor-ti-ya). La comida se bajó como por arte de magia y todos admitimos que nos sentíamos mejor. Fuimos de vuelta al ojo de agua y volvimos a correr a las doncellas oscuras de la charca y después nos bañamos. El día siguiente tres de nosotros hicimos una excursión a la frontera, a Santo Thomas un guarnición de tropas nicaragüenses. Nos recibieron con una demostración amistosa y nos trataron a nuestra primera cena nativa autentica de tortillas, carne rancia y huevos pasados. La comida aquí en estas colinas no es especialmente apetecible, y sobre todo ahora durante esta revolución. Hay muy poca revolución, pero hay un montón de saqueo. Las tortillas están hechas de maíz pobre, rancio, de barro de gusano, y molido húmedo para hacer un fino panqueque correoso sin condimentos ningunos. Carne está colgado en el sol pero no se seca, ya que las moscas llegan primeras y después la cresa. Este detallito no importa a los nativos. Con un aire despreocupado ellos quitan los gusanos con un palo, tira la carne al carbón, y presto, allí tiene un buen asado jugoso. Pero los huevos, si que están bien! A veces se necesita varios días para hallar el nido, y los huevos estarán bien tapados de paja durante un par de semanas o meses tal vez. Salen bastante peculiar - quizás estén un poco "podrido." Una de las comidas más preciadas aquí es la gallina dura, de buen linaje luchador. Una vez capturado, se limpia, más o menos, y se pone a hervir durante unos quince o veinte minutos. Este proceso culinario establece la carne y le hace un poco menos comible. Luego se sirve en su totalidad en una hoja de palmera. Esta gente utiliza las hojas de palmera como platos cuando no está demasiado perezosa para cortarlas. Cuchillos, tenedores, cucharas, tazas y platillos son desconocidos. La fiel mano humana cumple con todos esos objetivos y calabazas hacen tazas ideales. Por supuesto, los hombres utilizan cuchillas, el tipo que se lleva siempre y se utiliza para cortar árboles, matar bestias salvajes, y a otros hombres. Miden alrededor de cuatro pies de largo, con cinco pulgadas de hoja, pesan aproximadamente tres libras, y llevan la marca de "Collins" si sean el tipo de moda. Estos sirven de bastante buenas cuchillas de mesa. Miré a un colega utilizar uno para echar un poco de suero en un pastelito de harina de maíz. En los Estados Unidos los agricultores llaman a estas cosas cuchillos de maíz, pero aquí se llaman machetes. Nos quedamos en Santo Tomás solamente unas pocas horas y regresamos a Somotillo, de haber viajado unos cuarenta millas, fue una gran jornada de trabajo con caballos malos, y nuestros caballos siempre eran malos. Otro día se perdió buscando caballos otra vez. Por la tarde partimos a San Pedro, más elevado todavía en las colinas y ubicado hacia el noroeste. Terminamos el último de nuestros comestibles y dejamos todo el equipo menos una manta y una alforja. No podíamos llevar alimentos ni más equipos a causa de los inferiores caballos y los senderos cada vez más malos. Acampamos en las colinas esa noche y disfrutamos un poco de café y también las garrapatas, pulgas, mosquitos y tal inconvenientes pequeños. Llegamos a mediodía del día siguiente a San Pedro, guarnecido por tropas nicaragüenses, y nos disfrutamos de otra cena nativa de tortillas y huevos. De hecho, vivimos totalmente de comida nativa durante más de veinte días, y ninguno de nosotros se murió, aunque a regresar al campamento el oficial de sanidad me dio el gusto de tomar mucho Emetina. Somotillo, Santo Tomás y San Pedro eran pueblos de cuarteles con unas pocas chozas miserables con gran hacinamiento. En San Pedro conseguimos burros en vez de caballos, más aptos para trepar y más duros que caballos, incluso para el jinete. Cada vez que veo un burro ahora le quiero dar un puñetazo en la nariz y tirar las orejas. Acampamos en un saliente esa noche y el día siguiente a mediodía llegamos a Las Minas de Oro Cacamuya, administrado por un americano con el nombre de Samuelson. Allí el cocinero Mex de Samuelson nos dio comida verdadera y cuanta comida le hicimos echarnos! Nos bañamos también y cada uno se afeitó por primer vez en una semana. Todos nos parecíamos ser mucho menos feroz con el pelo quitado. No nos gustó para dejar Cacamuya un día y medio más tarde, pero tuvimos que ir a San Marcos de Colón, la sede de las tropas del Gobierno de Honduras. Había sido una lucha recién iniciada allí una semana antes y las casas estaban bien rociado con agujeros de bala. No nos quedamos más tiempo que necesario en San Marcos, y nos seguimos adelante a El Tamarindo donde nos reunimos con el General Fúnez con su ala del ejército revolucionario. Los soldados aquí en ambos lados eran principalmente indios, de pies descalzos, sin uniformes salvo una cinta de opciones en el sombrero para designar sus políticas. Todos los soldados llevaban grandes sombreros de paja, pantalones, pero nada de camisetas ni zapatos, y todos parecían piratas antiguos. Estaban armados con machetes, los Remington antiguos de 1884 de disparo único y 7 y 11mm Austriaco Máuser fusiles viejos, útil como garrote pero nada más. Todos los soldados estaban hambrientos y habían matado todo el ganado de la zona. Mientras estábamos en la cabaña del General un montón de soldados persiguieron una vaquillona hasta justo enfrente de la cabaña y le cortaron la cabeza con un machete. No les importaba despellejarla, solamente se la abrieron y cada hombre luchó para conseguir un pedazo de carne. Después cada hombre se huyó solito para hacerse un pequeño fuego y cocinar su pedazo. Algunos comieron la carne cruda. Nos alegramos de alejarnos de la inmundicia de este lugar. Nuestro guía nos llevó por mal camino durante la noche y nos perdió en el lecho seco de un río donde nos vimos obligados a acampar hasta la mañana y por fin encontrar el camino correcto a Somoto Grande. Cabe señalar que estábamos viajando hacia el Nordeste, parte del tiempo en Honduras y parte del tiempo en Nicaragua. Llegamos a Somoto sin más sucesos y tres de nosotros el día siguiente partimos para Honduras de vuelta. Nos vemos de nuevo desviados por una mala guía que nos llevó del camino correcto a una selva de malezas y ortigas. Llegamos a Macuelizo ya tarde en la noche después de un largo, caliente, pesado viaje en las mulas. Macuelizo es un pequeño pueblo escondido en un valle cuenco bien alto en la cresta de la montaña. Los habitantes son simples, religiosos y raramente se aventuran a más de veinte millas de sus hogares. A mediodía del día siguiente llegamos a Las Limas, la montaña más alta, más inaccesible, y justo en el interior de Honduras. Aquí General Carías, el gran jefe de la causa revolucionaria, y el aspirante presidente de la República de Honduras, ha establecido su cuartel general. Carias demostró ser un hombre de buena educación y fue rodeado por los funcionarios de la buena mentalidad. También nos reunimos con varios estadounidenses aquí, los miembros de la mesa en el ejército revolucionario y soldados de fortuna. La comida aquí estaba aún más grave que sufrido anteriormente a causa de la gran cantidad de militares aquí y todos los suministros se obtiene localmente, ya que no hay tal cosa como una base de suministros. El día siguiente llegamos a Las Manos y pasamos la noche. Casi nos congelamos esa noche como estábamos bastante altos y el aire estaba muy frío. Hacía tanto frío que nos podíamos ver nuestra respiración hasta las nueve de la mañana del día siguiente, antes de que el sol saliera brillante y lo suficientemente caliente para descongelarnos. Nuestro viaje al sur de aquí a Ocotal y de vuelta a Somoto Grande se realizó a través de un país hermoso, atravesado por muchos arroyos de montaña de agua clara y fría, y cubierto por un bosque denso de pinos que llenan el aire con una fragancia pesada de pino, tal como se vive a veces al pasar a través de nuestra propia correa sureña del pino. Un hombre fue dejado en Ocotal y los otros dos se juntaron con nosotros en Somoto Grande, pero se partieron el día siguiente para Managua por medio de la carretera a León, y los otros tres de nosotros regresamos a San Marcos, donde se rumorea que otra batalla pronto se llevará a cabo. Nos alojamos aquí tres días aguardando los acontecimientos y luego volvimos a Las Minas de Cacamuya. Me quede en Cacamuya y el Marino restante y el intérprete se marcharon la mañana siguiente para San Marcos una vez más y luego a Somoto Grande y de vuelta a Cacamuya, lo cual viaje fue realizado en tres días de viaje duro. Fue durante la estancia en Cacamuya que filtraron noticias del desembarco de unos doscientos marineros y Marinos en la costa norte de Honduras y su ocupación de Tegucigalpa. Recibimos las órdenes a volver a Managua, y hicimos viaje hacia casa pasando por San Pedro, Somotillo, Puente Real, Chinandega, y luego en tren a Managua. El viaje de regreso de Somotillo a Chinandega, a una distancia de unos sesenta millas, se hizo de noche nuevamente para evitar el calor. Cabalgamos durante una hora de Puente Real a través de la gruesa capa de polvo, y después, comenzó a llover, la primera de la temporada, y cómo lo hizo lluvia! Esto se produjo en forma de ondas y explosiones. El sendero se convirtió en un mar agitado de fango y agua, y el polvo tapando los caballos y nosotros se hizo en rayas de barro, lo que nos dio una apariencia desesperada. Varios del grupo habían comprado ropa interior nativa, que viene en brillantes azules, rojos y rayas. Estas prendas suelen blanquear después de un par de lavados, así que cuando el diluvio nos golpeo se perdieron su color tan rápidamente que un infante de Marina, vestido con una prenda roja brillante, se presentó algunos aspectos de ser herido, y el color no se desapareció tan rápidamente de la piel como de la prenda. Los caballos se asustaron a la cantidad inusual de agua remolino en el camino hundido, lo cual fue de tres pies de profundidad en algunos puntos, y tropezaron y se revolcaron, arrojando a un hombre y cubriendo a todos con barro. Nos presentamos un espectáculo lamentable al llegar en Chinandega el día siguiente, pero el día siguiente por la tarde, cuando llegamos a Managua una vez más, nos quedamos bastante nuevo y después de la primera gran comida alguien dijo, "Mírense a la diversión que tuvimos", a la que todas las manos contestaron, "Ajá". • ¶ 2: "The Revolution which has been going on in Honduras since last November" -- he's right: see this brief political history of Honduran & borderlands turmoil during this period (in an MSWord document), here. • ¶ 10: Cacamuya Gold mines owned by an American named Samuelson; in later years Mr. Samuelson will fulminate against the "a bunch of lazy barefoot Indians" as he characterized Sandino's supporters. • Some vivid & evocative descriptions of the landscape & social geography here -- if read against the grain of the condescending tone. • Interesting descriptions of Tiburcio Carías Andino, who in the early 1930s would cement his dictatorial rule over the country; see this Excel file for a graphic illustrating the outlines of Honduran political struggles during these years. • ¶ 10: Cacamuya minas de oro propiedad de un estadounidense llamado Samuelson; en años posteriores el Sr. Samuelson, se despotricará contra los "un montón de Indios perezosos descalzados" como el calificó a los partidarios de Sandino. • Algunos vivos y sugestivas descripciones del paisaje y geografía social aquí -- si se lee en contra de la costumbre del tono condescendiente. • Interesantes las descripciones de Tiburcio Carías Andino, que en los inicios de la década de 1930, el cementó su gobierno dictatorial en el país; para ver un gráfico que muestra las líneas generales de luchas políticas hondureñas durante estos años ve ESTE ARCHIVO DE EXCEL.